Fish in a Barrel is a mission in Grand Theft Auto: San Andreas, given to protagonist Carl Johnson by San Fierro Triads leader Wu Zi Mu from the office at The Four Dragons Casino, located along The Strip in Las Venturas, San Andreas. 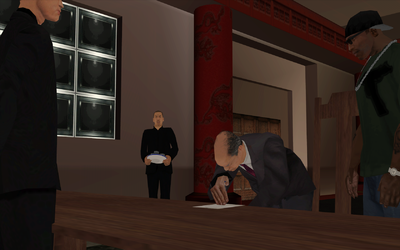 Carl, along with Ran Fa Li, enter the office in The Four Dragons Casino, where they meet Wu Zi Mu. Woozie asks the two of them to sign some papers, which make them co-owners of The Four Dragons Casino. This now marks a beginning of a new management for the casino and marks the beginning of a new partnership between the trio as Woozie has proclaimed them partners in managing and owning The Four Dragons Casino. Wu Zi Mu: Mr. Ran Fa Li. Wu Zi Mu: Gentlemen, can I have your marks please? Wu Zi Mu: Gentlemen, or shall I say, partners! Carl Johnson: Oh, I'll drink to that! This cutscene was supposedly intended to be part of an actual mission, wherein Woozie would give CJ a golf club and order him to protect Ran Fa Li from a Mafia attack. Although Carl owns a share in the Four Dragons, it never becomes an asset. The only way to receive casino profits is to win in any of the games at the casino. This page was last modified on 16 April 2015, at 13:02.